Fifteen bouts will be decided on the opening night of the first edition of the 2018 National Elite Championships at Dublin’s National Stadium tonight. Defending lightweight and super-heavy champions Pat Mongan and Martin Keenan meet Dillion Duffy and Geoff Kavanagh, with former titlist Dean Gardiner facing Thomas Carthy in the opposite half of the 91kg+ last-eight draw. Mongan beat Russia’s Vladimir Nikitin, who controversially beat Michael Conlan at the Rio Olympics, in a round robin at the Stadium last year. Rio Olympians Joe Ward and Brendan Irvine and European medallists Kurt Walker and Sean McComb will miss the Championships because of World Series of Boxing (WSB) commitments and the Commonwealth Games in Australia. Ward, the current European Elite light-heavy champion, is due to line out for the British Lionhearts in the WSB in Newcastle next weekend versus the Croatian Knights. The WSB is a path to the World Championships, which will act as a Tokyo 2020 qualifier. 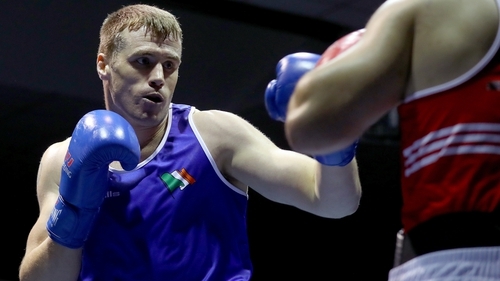 Kilkenny southpaw Darren O’Neill, who captained the Irish boxing team at London 2012, is out of the 2018 tournament because of a hand injury and the heavyweight belt he won last year is vacant, along with seven other titles. Mongan, Keenan and Dean Walsh, nephew of ex-Irish head coach Billy Walsh, are the defending 2018 champions. Defending women’s lightweight champion Kellie Harrington, a world Elite finalist, meets former European Youth champion Amy Broadhurst in the 60kg final. The Irish Athletic Boxing Association are running the National Elites again later this year in September (women) and November (men) to facilitate boxers going into the qualifiers for Tokyo 2020. The weigh-ins for tonight’s quarter-finals will be held between 8am and 9am today and 12pm and 1pm.